There were probably precious few things that could have forced me to abandon my lazy summer ways and get back to blogging like I should. Mr. Punkernoodle eating bugs would be one of those things. And he did. And here I am. That he ate bugs should come as no surprise to me. That he ate them voluntarily — meh, not shocking. That his ego was big enough as to make it impossible, on some manly score card of gross-activities-in-the-name-of-self-respect, to refuse eating bugs — that was a little unexpected. Before I flog him, I should make a point of saying that his garden this year is impressive. It might even be his best yet. On our tiny city lot, he’s managed a carefully rotating and seasonally tiered bevy of produce: Several kinds of lettuce (early, middle, late and some varieties that somehow have been going now since spring); sweet peas; a field of strawberries that tasted so sweet and warm when you pulled them off their stems and popped them in your mouth that it was like dropping a spoonful of jam onto your tongue; tomatoes coming on any day in about 25 pots; cucumbers; beans, peppers, piles of basil and mint, chard; carrots that smell like sugar; a field of 20 potato plants in three varieties that will likely give us enough store to take us into Thanksgiving mashed potatoes and beyond; garlic; shallots; onions; rhubarb; blueberries; raspberries; plums. Surely there’s more I’m momentarily forgetting. Oh, right, the brocoli and cauliflower. So the brocoli heads were bursting from their plants in round, jade-colored bouquets. We ate a few heads and had lots left to enjoy when, a few days ago, I noticed while preparing another skillful garden meal that there appeared to be a color variation among the little sprout tips at the very end of the brocoli. I’ll call them the buds since it’s really beyond me what the actual anatomical name for that part of the vegetable is. To be exact, some of those tips, I noticed, were more grayish in color, a little duller looking, than their jade neighbors. Being historically a little food skittish and critter paranoid, I delved deeper into the brocoli head in order to quash my rising panic that there might be something living in there. What I found was that, in fact, there were some things living in there. Many things. Many gray, microscopic things that, when scrutinized really really closely, had round gray bodies and six legs each. Fast forward to tonight. Menu: Italian chicken sausages, Israeli couscous, fresh sweet peas and carrots, and some just-picked brocoli and our first ready cauliflower. As Mr. Punkernoodle is washing the cauliflower — lovely white head with tight bud clusters and a soft violet underhue (why does this sound pornographic?) — I glance over and notice a subtle shade of something suspicious. I lean in, peer closer with my eagle food eyes. Yes, they’re there. The gray bugs. I do a quick check of the brocoli head laying nearby on the counter in what now seems like a pool of guilt. Gray clumps, too. It’s not just that there are bugs, I try to argue to Mr. P. These bugs, whatever the hell they are — probably something in the tic family — burrow deep within the bud tips and cluster around the underside of the brocoli florets in creepy, fuzzy, miniscule clumps. There are dozens of them, hundreds, burrowed in to the whole cauliflower and brocoli heads. They are impossible to extricate. You cannot rinse them all out, it is not within our human power. I will try, Mr. Punkernoodle asserts. His fingers have tilled the earth. He has hand-watered his bounty for one hour and 17 minutes a day. He cannot give up these cabbages without a fight. 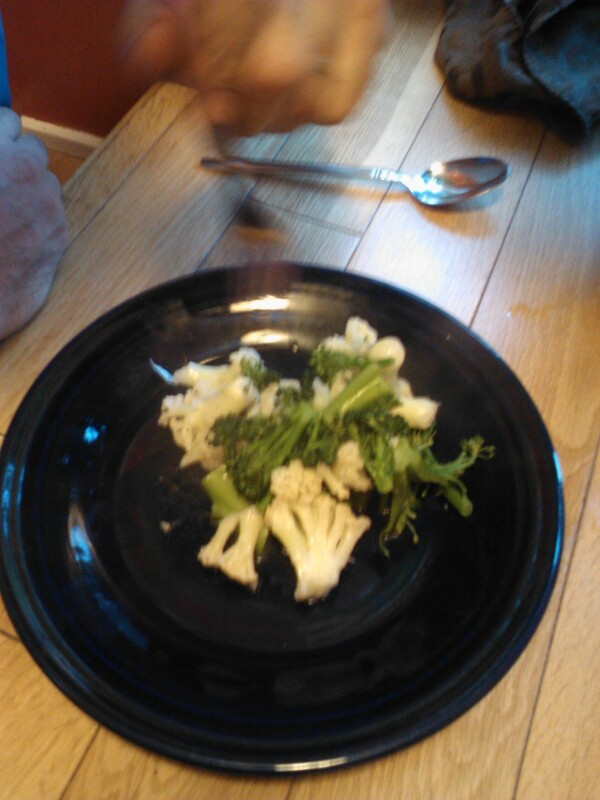 He picks through the brocoli and cauliflower, sprays inside each tiny crevice. When he is done, I peer over to examine. So there we have it. Steamed bugs and sausage. He looked mighty satisfied after his supper, like he was ready to sow a field. Must have been the extra protein.